Now it would be very remarkable if any system existing in the real world could be exactly represented by any simple model. However, cunningly chosen parsimonious models often do provide remarkably useful approximations. For example, the law PV = RT relating pressure P, volume V and temperature T of an “ideal” gas via a constant R is not exactly true for any real gas, but it frequently provides a useful approximation and furthermore its structure is informative since it springs from a physical view of the behavior of gas molecules. For such a model there is no need to ask the question “Is the model true?”. If “truth” is to be the “whole truth” the answer must be “No”. The only question of interest is “Is the model illuminating and useful?”. The next entry will lead you through an animation model of the particles of the standard model. Using swirling vertexes of connected space, particles matching the quantum properties of the fundamental particles. There are a lot of illustrations to follow. The illustrations are here to help the reader build a mental image of the mathematical objects presented. This mental image helps the reader better remember facts about the particles (ie. 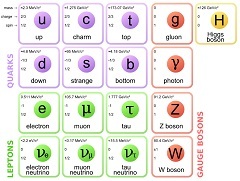 gluons have 8 different styles). This mental image allows the reader to better anticipate what happens over time (ie. Beta decay, where a proton and an electron are made from a neutron). Lastly, this mental image is very important in human understanding of the relationship between mathematics, physics and the real world.